If you are missing the old stationary phone, you can have that experience back with the help of your iPhone. The iFusion is a device that can prove to be very useful in a home or business environment, particularly for those that are experiencing a bit of nostalgia over the classic stationary phone and its versatility. 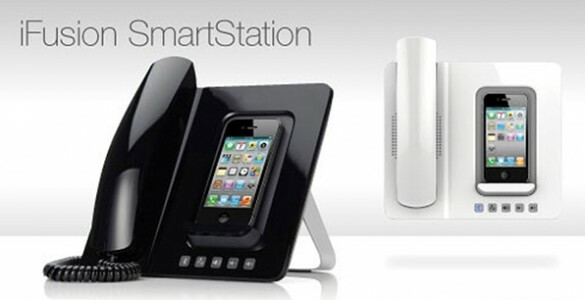 The iFusion is one of the most innovative integrated communications docking stations for the Apple iPhone. It combines the immense list of iPhone facilities and features into a single device that can be easily controlled. The iFusion is designed to use its state of the art Bluetooth technology along with a duplex speaker phone and a patented ergonomic design to offer the best voice quality available. You will be able to use a traditional phone from your office, allowing you more comfort and better handling while keeping your iPhone out of harms reach as well as constantly charged. If you have health concerns or are simply paranoid when it comes to talking over the phone for too long the iFusion is ideal as it will give you all the modern benefits of the iPhone without any of the possible health side-effects. The iFusion is a perfect solution for supplying power to your phone, charging your batteries and synchronizing all your media and entertainment. So feel free to walk around the house and listen to your favourite music or podcasts while also having your iPhone docked, charged and ready to take or give a call like a classic stationary phone. The well thought out design of the iFusion allows you to either mount it on a wall or simply place it where you best see fit, without the danger of it falling over or damaging your precious piece of tech.